Extreame Savings! Up to 46% off on Photo Album Accessories at Home Decor Outlet Store. Top brands include Connoisseur, Diva At Home, & DigitalArts.ws. Hurry! Limited time offers. Offers valid only while supplies last. 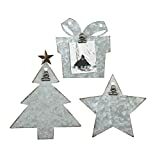 Diva At Home Set of 3 Gray Iron Decorative Galvanized Holiday Clip Photo Holder 9"